Arginase-1 (Arg-1) is an important drug target for cancer immunotherapy. Expression of Arg-1 by tumour-infiltrating myeloid derived suppressor cells induces local L-arginine depletion, which results in reduced T-cell and natural killer cell proliferation. Despite increased insight in the role of Arg-1 in tumour immune suppression, there is still a limited number of Arg-1 inhibiting chemotypes available. To identify novel inhibitors, a new high-throughput screening (HTS) assay was developed by NTRC. The assay will be launched as Arginase Gold™ at the EORTC-AACR-NCI symposium, November 13-18, in Dublin. Arginase Gold™ is a homogenous mix-and-measure assay based on a novel and proprietary chemical probe. In contrast to previously reported arginase assays, this assay requires only two addition steps, short incubation times and mild reaction conditions. Moreover, it is a gain-of-signal fluorescence assay and allows for kinetic measurements. 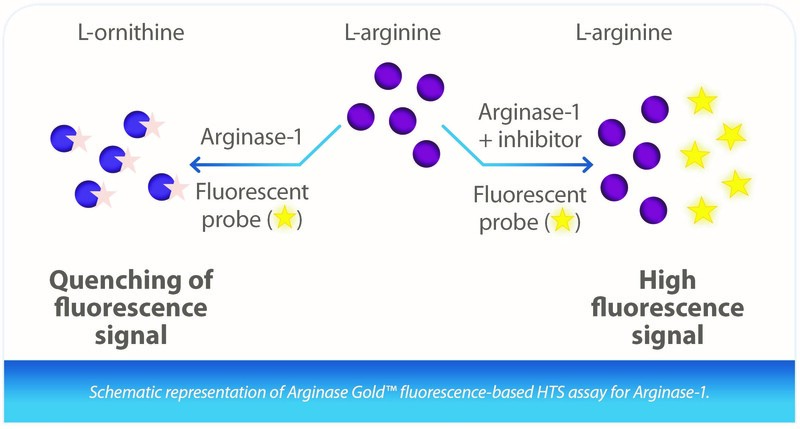 The Arginase Gold™ assay was validated for 384-well automated HTS. Profiling of known Arg-1 inhibitors revealed new insights into their binding kinetics. NTRC will be happy to provide more information at booth A5 during the exhibition of the ENA2018 conference – Suzanne van Gerwen, Sales & Marketing Manager, will be your hosts at the booth. Furthermore, NTRC will present 2 scientific posters during the conference. The first is on biomarker identification for patient stratification by cancer cell panel profiling and related clinical relevance, the second is on the assay technology for screening Arginase-1 inhibitors. Details are provided below. Title: Cell panel profiling yields additional drug response biomarkers for kinase inhibitors approved for clinical use, presented during the Poster Session on Molecular Targeted Agents – PART I, on November 13th 2018, 12h – 19h. Presented by Joost Uitdehaag, Senior Investigator. Title: Identification and characterization of Arginase-1 inhibitors for cancer immunotherapy using a novel high-throughput screening assay, presented during the Poster Session on Immune Checkpoints, on November 14th 2018, 10h-17.30h. Presented by Yvonne Grobben, Research Scientist.